Whether you’re planning a wedding, a shower, or any other major party for a major event, you’ll probably have people who want to congratulate you—which means you’ll need a registry. This week, we’re looking at five of the best registry services for events of all types and sizes. CheckedTwice is a bit of a cross between a service like Pinterest and a simple retailer wishlist, but it brings the best of both services together. You can sign up with an email address, and then build a visual list of items for a wedding, a graduation, a shower, or any other event that needs a registry—even simpler events like birthdays. You can add items from retailers all over the web, or even offline retailers by filling out a little information about the item you’re looking for. Then you share it with everyone you need to see it, and let CheckedTwice handle the rest—your family and friends will be able to claim items in the background, see what others have claimed, and all the while you’ll have no idea who’s purchased what. They actually have features geared towards birthdays and holiday gifts for the family, and the service is available via the web and on your mobile device. Zola offers a wealth of options when it comes to crafting and organizing the perfect gift list. You can get started using some of their starter collections or inspiration boards, do group funds or boards that multiple people can add to and then share with others, and of course, it works like a regular old wishlist—one you can add items from anywhere on the web. 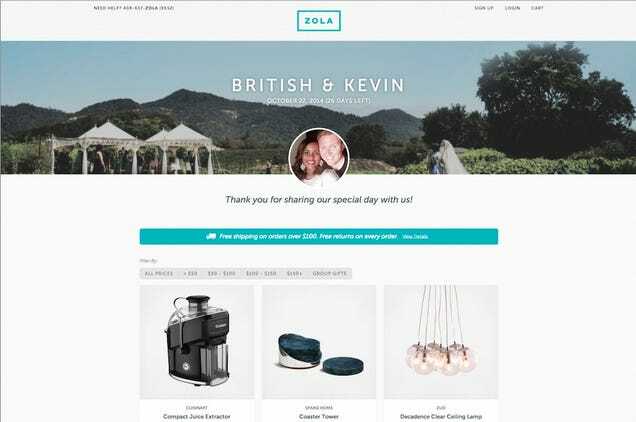 If you’re looking for specific brands or types of items, you can find them and add them to your registry quickly, or you can use Zola to fund experiences instead of stuff—trips, honeymoon funds, and more. You can even just build a cash fund and call it a day. Zola has a bit of a focus on household and kitchen goods, but that doesn’t mean you can’t expand beyond it by adding your own items. Plus, Zola’s barcode scanner lets you add things to your registry quickly from your smartphone—useful if you see things out and about that you’d like to add. Like some of the other services on the list, Knack allows you to build a registry of items from all over the web, from large and small retailers. Knack positions itself opposite huge retail registries and lists, and points out that not only can you add things from small web retailers and artisan, crafty shops online, you can also add items only available offline at brick-and-mortar stores or small shops in your neighborhood. You can, of course, use their sample items and collections to get your registry off to a good start. You can also fund events, like a honeymoon trip, or the things you’ll need for that trip. Plus, Knack makes it easy for the people you’ve shared your registry to get a hold of those items you’ve listed, whether they’re available online or off. 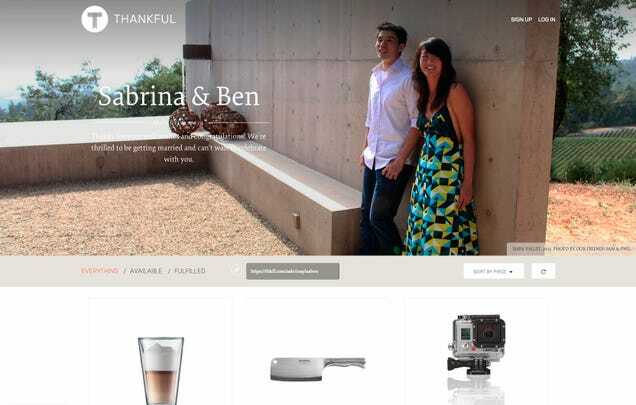 Thankful positions itself as the anti-stuff registry. Sure, you can build a list of just items if you want, but the service challenges you to tell your loved ones what you’re interested in as opposed to a big list of stuff from major retailers that you want people to buy for you. The service lets you crowdfund experiences as well, like honeymoons and special events, as opposed to just weddings and showers. In a lot of ways, Thankful is one of the most attractive registry sites we’ve seen, complete with beautiful cover photos and descriptions that tell your event’s specific story. Like other entries here, you can add items from all over the web, from any retailer, large or small. 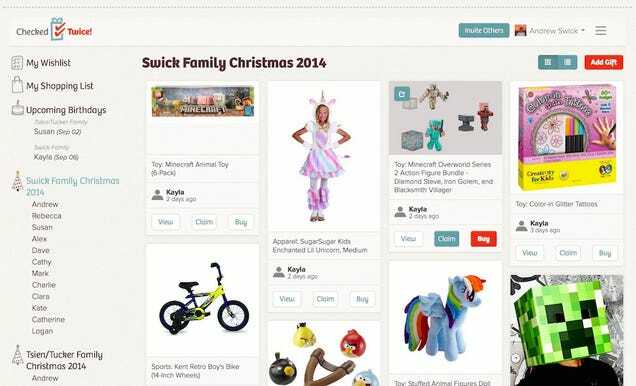 You can even include things like charity donations and cash on your Thankful Registry. The service also has a browser bookmarklet that makes the process easy. All My Gifts is actually a mobile app for Android and iOS that keeps track of all of your registries, and the things that have been purchased from them, so you can be sure there are no duplicates on any of them, and no one buys you duplicates of any specific item. 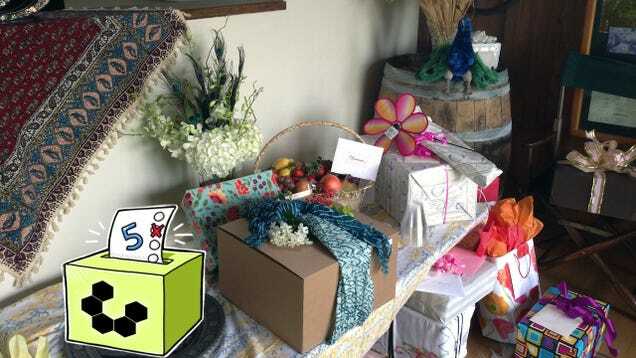 Ideally, the app allows you to always see who purchased what for whom, so you can track your gifts and packages, remember to give your thanks to everyone who bought you something, and simplify the entire process of building and keeping registries up to date. The apps integrate with Facebook, so if you have an Facebook event for your special day, it’ll plug right in and populate the guest list automatically. It also features barcode scanning so you can keep track of what you’ve received and what you want.